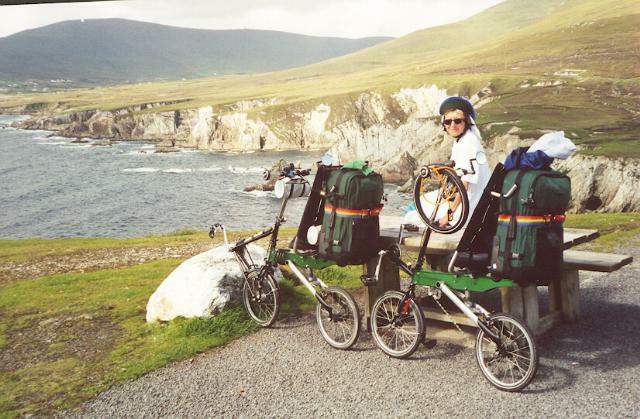 We decided to test and evaluate our new Grasshopper-5 bikes on a self-contained trip along the West Coast of Ireland. We first spent a delightful few days at CycleFest in Lancaster, England, and then on to Ireland. During this trip we purposely used all forms of travel - aircraft , bus, taxi, train and ferry. Because of the certainty of rain we decided to use hostels and B&Bs rather than camping. 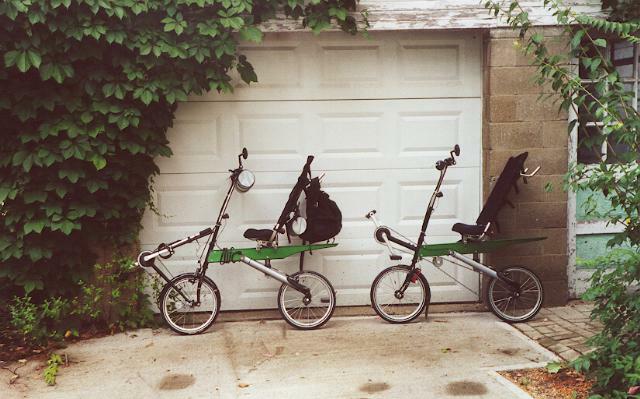 The following picture shows the two bikes just prior to packing them for the trip. Notice the extensions to the BikeE short seats with bar-ends attached - very convenient for throwing on backpacks (shown), plastic supermarket shopping bags, or holding our carry-on luggage in place. We also mounted BikeE seat clamps on the underside of our carry-on luggage. 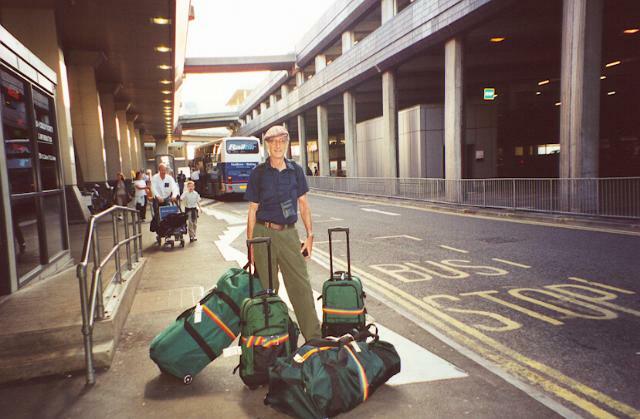 The following picture shows our arrival in Heathrow airport, London. Notice the two dufflebags containing the bikes, and our two carry-ons. When I get bored with cycling, I flip the bike and rollerblade down the hill. On a long ride, spinning the wheel helps me to relax and meditate. When I pack the bike in a duffel bag the handlebars go underneath, allowing me to conveniently roll it in airports. The following picture shows both bikes fully loaded on a typical day during our trip. We are having lunch on the scenic Atlantic Drive on our way to Achill Island. Nili doesn't normally carry our spare tire on her handlebar. She moved it from behind the seat to get at the plastic bags holding our picnic lunch.